In August 2018, President Jimmy Carter was interviewed on TV and asked about his views concerning the current political situation in the United States. I was captured by the vitality of this 93 year old man’s lucid and laconic answers to a variety of other questions asked of him. He stood tall wearing a blue working shirt with a red bandana around his neck and showcased his full-toothed smile. He was enduring the summer heat in Indiana while working with others for “Habitat for Humanity.” Many will recall that in 2015 he was diagnosed with melanoma, a lethal skin cancer that had metastasized to the brain. His prognosis was grim until a ray of hope was presented to him. Melanoma is the deadliest of skin cancers. The tumor develops when the pigment-producing cells of the skin (melanocytes) go amuck. If the melanoma spreads to the brain or other organs, the outlook is particularly gruesome. 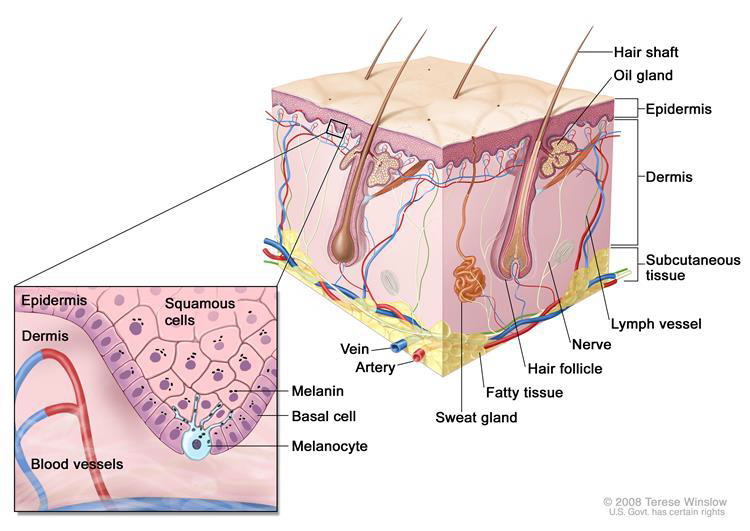 Source: National Cancer Institute Anatomy of the skin, showing the epidermis, dermis, and subcutaneous tissue. Melanocytes are in the layer of basal cells at the deepest part of the epidermis. The immune system is our Department of Defense which recognizes and protects us from foreign invaders. Ideally, the system attacks foreign cells in the body while not disturbing normal functioning cells. However, melanomas behave as a highly sophisticated intelligence operation. Melanomas enter the body and work as undercover agents. They produce a protein (PD — L1) that help trick the immune system into thinking they are normal cells. They disrupt the ability of the immune system to recognize melanomas as foreign bodies. As a result, the tumor has the freedom to grow, multiply and spread throughout the body. President Carter decided to seek the advice of the doctors and scientists at Winship Cancer Institute of Emory University in Atlanta, Georgia. Among the challenges the doctors faced was to understand how the tumor mislead Carter’s immune system into believing that the melanoma was a friendly inhabitant of his body. The next question, of course; What to do about it? Scientists discovered that on the outside of the body’s immune T cells are proteins (PD 1). They also discovered that PD — 1 acts as a checkpoint “on-off” switch. When the proteins on the outside of the body’s immune cells hook up with the proteins on the outside of the melanoma cells (PD-L1), the immune system’s alarm switch remains in the “off” position. The T cells do not recognize melanoma as the enemy. The system has been duped into believing that melanoma cells are friendly and the T cells do not attack. (Please refer to images below). The President agreed to the surgical removal of the tumor from his liver. He also consented to radiation therapy (stereotactic radiation) to treat the small tumors of the brain. What were uncharted waters, and his ray of hope, was his decision to go forward with immunotherapy to tame this savage tumor. 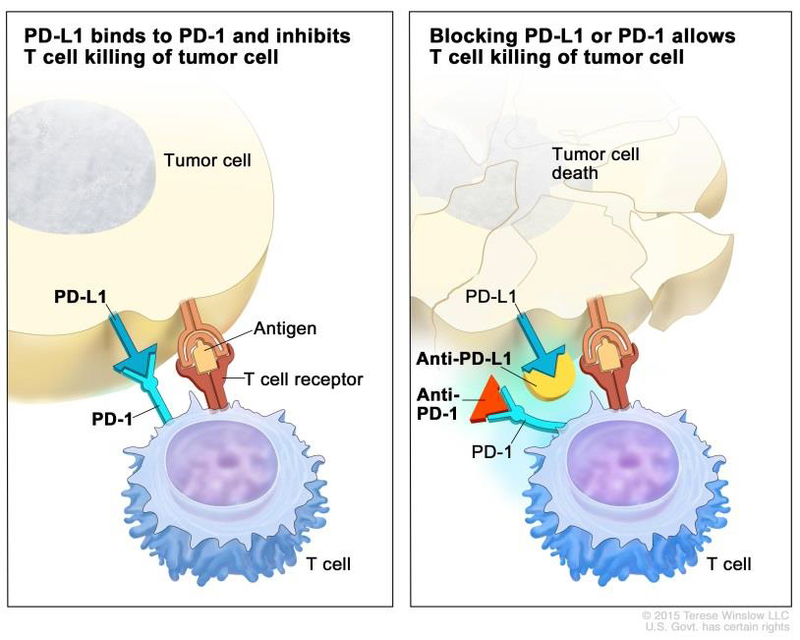 In 2015, pembrolizumab was a new immunotherapy drug that targeted the off switch of the molecule PD-1. In Mr. Carter’s case, the drug worked to “turn-on”, activate the body’s T cell immune system causing the melanoma to shrink and not be detectable. Doctors are cautious about using the word “cure” for patients with metastatic melanoma. It seems that the drug has helped Mr. Carter and others to live longer and be cancer free. Such medications offer new hope to patients with advanced melanoma. Stereotactic Radiation uses 3D imaging to deliver precise beams of radiation to small spots of cancer in the brain instead of the entire brain. Diameter — there is a change in size, usually an increase; if the diameter is greater than the width of a pencil (6mm) it might indicate melanoma. Source: National Cancer Institute — Immune checkpoint inhibitor. Checkpoint proteins, such as PD-L1 on tumor cells and PD-1 on T cells, help keep immune responses in check.